Is your small business struggling to get reviews online? It’s hard to compete with the big guys who have hundreds, even thousands, of amazing online reviews about their products and/or services. And that fact is made all the more important because these days, almost nobody buys something without first checking out the online reviews. In fact, according to a survey conducted by Bright Local, 86 percent of consumers polled said they read reviews for local businesses. So, if your potential customers are coming across your small business online and running away in the opposite direction once they see your lack of endorsements, what can you do to turn that around? 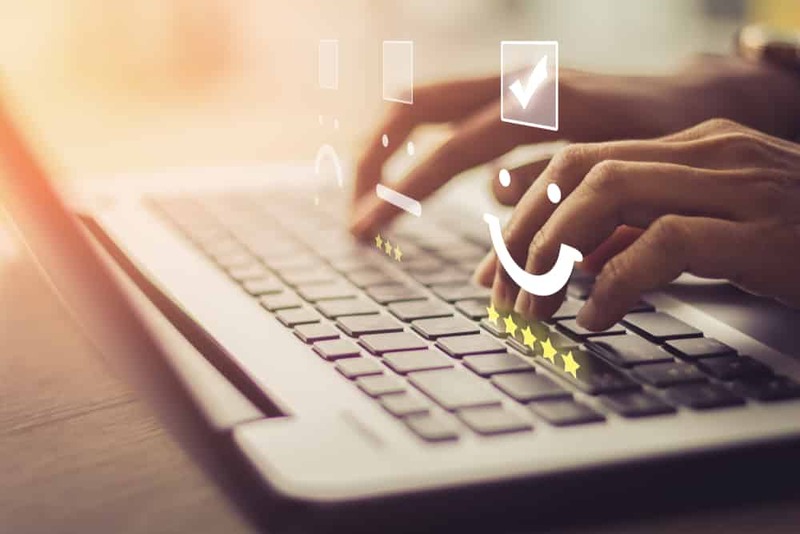 If your online business profile is still looking lonely, with only one or two reviews, check out these five tips to get more online reviews for your small business. 1. Create an email campaign. One way to encourage more online reviews for your small business is to create an email campaign. If you already have an active email list, you’re off to a great start. Your email subscribers are your biggest fans, so chances are, if you send them an email asking them to leave your business an online review, they’ll do it. If you haven’t built an email list yet, get started by signing up with an email marketing software and adding a popup on your website to encourage people to join your list. Plus, if visitors can place an order from your website, you should already have their email addresses to add to your email list. To get the most responses, send a triggered email campaign. This means your online review email will send automatically any time a customer places an order, like what happens in the example below from Everyday Art. Sending an email right after consumers’ purchases, while the positive experience is still fresh in their mind, will get you the most online reviews. 2. “Ask” them in person. Your regular customers who walk through your doors might not have checked you out online beforehand, but by advertising offline that you want more online reviews, you’ll be able to reach all of your customers — new and old. 3. Reply to every online review. When asking people to review you online, you open yourself up to bad reviews, too — and that’s okay. Just remember to respond to every review, in a calm, helpful fashion and seek to turn any poor review into a positive experience. What’s important is that you shouldn’t respond just to negative reviews; you should respond to positive reviews, as well. Replying to your reviews will show other future customers that you’re active in your online communications. In fact, according to a study in the Harvard Business Review, replying to customer reviews results in better ratings overall. Through their studies, the researchers found that users exposed to management responses — for example,users who read your response to a negative comment from another user — left ratings 0.1 “stars” higher than those who had not. This finding applied in the same way to responses to positive reviews. Additionally, customers who read management responses were also less likely to leave a trivial or unsubstantiated negative review. Another way to get more online reviews is to share the glowing reviews you’ve already received. When others see that people are leaving you great reviews, they’ll be more inclined to do so themselves. In fact, according to Psychology Today, people look at what others are doing to learn what’s correct. That’s social proof in action. Not only does this tactic work to generate more online reviews for your business, it also helps to advertise your business and get more customers through your doors. 5. Go above and beyond in customer service. You can use all the tips and tricks in the world, but if your business is giving poor customer service, you’ll never get online reviews — or else you’ll get a ton of scathing ones. The easiest way to get more online reviews for your small business is to go above and beyond for your customers. Most people don’t leave a review for a pleasant but mundane experience, but people will be more likely to leave a great review for your business if you’ve provided them with an amazing experience. So, try to make your customers’ day by saying “please” and “thank you,” sending a personalized thank you note in their online order, giving a small discount to apologize for a customer service issue and so on. Customers will remember your kindness and return the favor by leaving you a five-star review.